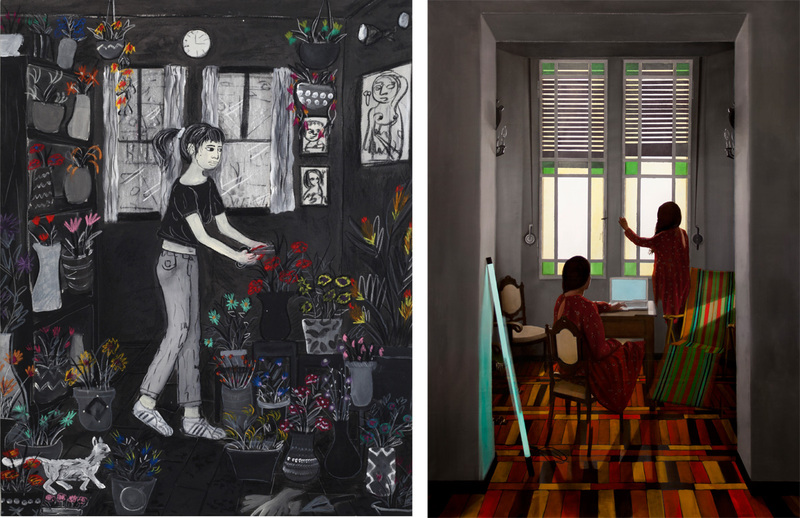 Antonio Colombo Arte Contemporanea is proud to present Everyday Is Like Sunday, the double solo exhibition of the artists Andrea Fiorino and Dario Maglionico, who represent generation Y’s new figurative painting. The title of the show, taken from an old song by Morrisey, former leader of the English band The Smiths, it is well suited to the weekday atmospheres of Andrea Fiorino’s paintings as well as Dario Maglionico’s domestic settings. The attention to unexpected or just imperceptible aspects of everyday reality is, in fact, the only point of contact between the researches of the two artist friends, radically different in their technical and stylistic approach to painting. The exhibition includes around thirty large and small works. There are, in fact, Dario Maglionico’s oil paintings on canvas, and the mixed technique works of Andrea Fiorino, who blends acrylics, charcoal and chalk pastels on cotton canvases and on paper. Andrea Fiorino mixes real and imaginary stories in a painting with a strong narrative imprint, dominated by suspended atmospheres and settings marked by a subtle melancholy. The Sicilian artist paints on raw cotton canvases using an almost monochromatic palette, interrupted by quick color accents. His glance is directed to seemingly unimportant details, like a basketball, a skateboard, a portable radio or the design of a t-shirt, elements which underline the fundamentally prosaic nature of his folk tales, where the ordinary and the extraordinary seamlessly mix up. Interested in the analysis of human relationships and of friendship and sentimental bonds, Fiorino especially depicts scenes of convivial life, moments of collective leisure, pastimes and distractions of a generation grown up in the shadow of the crisis, without too many expectations towards the future. oblique floors, welcome the traces of the passage of friends and family, psychic residues that, as persistent ghosts, hover between corridors and bedrooms, bathrooms and dining rooms of typically Italian homes. Reificazioni is the title of the series of paintings that, with a detailed pictorial style, at times almost photographic, document the artist’s interest in the representation of suspended atmospheres, in which the signs of past and present events synchronically converge. The light, an element already investigated in the series entitled Studi Del Buio, in the last works takes on a central role, practically radiating from every source, from windows to mirrors, from lamps to laptop screens. Andrea Fiorino was born in 1990 in Augusta (SR), where he attended the A. Gagini Art Institute. In Milan, he graduated in Painting at the Academy of Fine Arts of Brera. Among the main solo exhibitions: in 2017 They shine in darkness, curated by Claudia Contu, Ateliermultimedia contemporary art gallery, Vienna; in 2016 Della Stessa Sostanza (with Riccardo Gusmaroli), curated by Arianna Beretta, Circoloquadro, Milan, and The Family, Opere Scelte, Turin; in 2015 If You Came Back, curated by Fabio Carnaghi, Chiesa di S. Ambrogio della Vittoria, Ark, Parabiago (MI), Paradise Lost, curated by Elisa Fusi, Circoloquadro, Milan. In 2014 Andrea Fiorino, Robert Kananaj Gallery, Toronto (Canada), Another Place, curated by Daniele Piparo, S.I.A.M, Milan. Among the group shows the most recent are: in 2018 Gastspiele, curated by Opere Scelte (Turin), Botscaft, Berlin. In 2017 Limiti e Confini, curated by Sabino Maria Frassà, Premio Cramum, Grande Museo del Duomo di Milano, Milan; Novantiani, curated by Camillo Langone, Fondazione Pio Alferano, Rome; Premio Combat, finalist, Museo Civico Giovanni Fattori, ex Granai di Villa Mimbelli, Livorno. In 2016 Immagini dal sottosuolo, curated by Marco Marelli, Atelier Multimedia, Vienna (Austria); La presenza nascosta, curated by Fabio Carnaghi, Civico Museo Archeologico, Angera (VA); Contexto, curated by Casa Testori, Edolo (BS). Dario Maglionico was born in Naples in 1986. After graduating in Biomedical Engineering at the Polytechnic University of Milan, from 2014 he lives and works in Milan, devoting himself exclusively to painting. Among the solo exhibitions: in 2017 Where I Am, I Was, curated by Sharon Di Carlo, Apart Spazio Critico, Vicenza; Everything At Once, curated by Ivan Quaroni, Antonio Colombo Arte Contemporanea, Milano; in 2016 Sincronie, curated by Claudia Contu, Pinacoteca Del Castello Visconteo di Legnano, Legnano (MI); in 2015 Claustrophilia, curated by Ivan Quaroni, RivaArtecontemporanea, Lecce; in 2014 Reificazione#, curated by Filippo Ciavarella, S.I.A.M, Milano. Among the group shows: in 2018 If The Walls Could Talk, Alice Black Gallery, London (U.K.); in 2017 19° Premio Vittorio Viviani, Villa Vertua, Nova Milanese (MB); in 2016 Christmas Circus, Antonio Colombo Arte Contemporanea, Milano; Premio Marchionni, MAGMMA Museum, Villacidro (VS); 57° Premio Internazionale Bugatti Segantini, Villa Vertua, Nova Milanese (MB); in 2015 Otherness. Identità IN-definizione, curated by Out44, Fabbrica del Vapore, Milano; Painting as a mindfield, curated by lvan Quaroni, Area\B Gallery, Milano; 9° Premio lnternazionale Arte Laguna, Nappe Arsenale, Venezia.